Throughout our rich history we have welcomed famous visitors from around the world. Guests include numerous heads of state, film stars, sports personalities and royalty. During World War II, due to Portugal's neutrality, Estoril was a haven for European royalty, and became known as the "Coast of Kings". We were the home of various royals and also hosted many British and German spies meeting at our Bar. Later, these stories of intrigue and espionage inspired various famous books and films. Our Palace provided a stage for the James Bond movie, "On Her Majesty's Secret Service". Bond's father, Ian Fleming, when staying in Estoril during the war, got also some inspiration from the neighbouring Casino, that lead to his 'Casino Royale'. 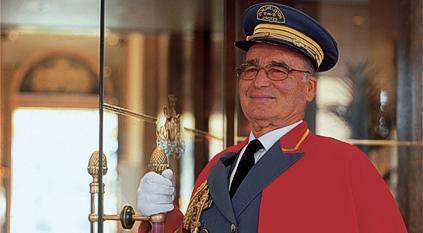 Hotel Palácio Estoril has since benefited from several refurbishments and renovations. Today, it offers all the modern comforts and conveniences of an exclusive five star resort, with the greatest care to preserve the hotel's unique classical heritage.